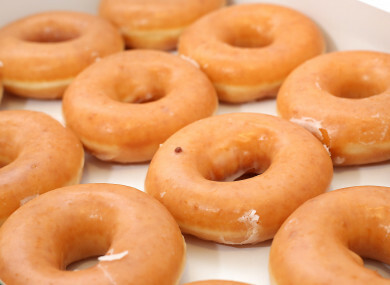 US chain Krispy Kreme had 7,000 boxes of doughnuts to give away, before they were stopped by council officials. BELFAST CITY COUNCIL was forced to stop a free doughnut giveaway this afternoon after hundreds of people braved the rain for the promotion in the city centre. Crowds queued outside Belfast City Hall for the giveaway today, when US chain Krispy Kreme had 7,000 boxes of doughnuts on hand to mark the opening of its first Irish store. However, The Irish News reports that crowds were left disappointed after council officials found that Krispy Kreme did not have a permit for the event. In a statement, Belfast City Council said that while the giveaway was “a wonderful impromptu gesture that raised the spirits of people in Belfast”, it had not been informed about it ahead of time. The council said: “Our enforcement team work hard to keep the city streets free of litter so the staff member intervened as part of his daily duties to explain that to carry out this type of activity requires a permit. In a statement, a spokeswoman for Krispy Kreme said the company was apologising to Belfast City Council and would make a £250 donation to a local charity. The chain’s first store is set to open in later this month. Email “Belfast City Council intervenes after hundreds queue outside City Hall for free doughnut giveaway”. Feedback on “Belfast City Council intervenes after hundreds queue outside City Hall for free doughnut giveaway”.